The noble soldiers of Hawkshold bring their superior training and courage to battle as they defend their lands. Your Hawk armies include a broad range of infantry, ranging from the cheap (but fragile) Peasant Mob to Great Swordsmen in heavy plate. Your Longbow men are the most powerful archers in the game, with superior skill, power and range, forcing your enemies to advance into your ranks or die at a distance. Finally, a broad range of cavalry options means that any break in the enemy line can quickly turn into a slaughter. As the commander of the Hawks, you can inspire your troops with Bravery, ensuring that your line holds against the most fearsome charge. Spending one command action will increase a unitâ€™s courage by three, until such time as it rolls above its base courage during a rout check. 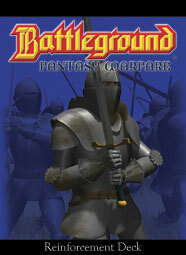 The Men of Hawkshold are Battlegroundâ€™s first human army. The Hawks, as they are commonly known, are well-trained and highly disciplined. As General of a Hawk army, you have a broad range of infantry troops at your disposal, ranging from inexpensive (but highly unreliable) peasant mobs to foot knights with sword and shield or two-handed greatswords. Your pikemen are particularly skilled at fighting enemy cavalry and large monsters and your longbowmen are without peer as ranged attackers. You also have the widest range of cavalry units, from lightning-fast scouts to knights in plate mail astride barded warhorses. The Hawk armyâ€™s special ability is Bravery â€“ you inspire your troops to fight even when death seems imminent. For one command action you can increase a unitâ€™s courage by three. Bravery lasts until the unit rolls above its base courage during a rout check. How can you play the Men of Hawksfold without the reinforcements? This set has a much greater variety of units than the base deck, and will change your tactics dramatically.